This is the twenty-first of my “101 Things that Moms with Eczema Child Do Differently“, a tongue-in-cheek look at the many unique situations that we face. For more cartoons, click here to view. Thanks and so happy that you like the cartoons! 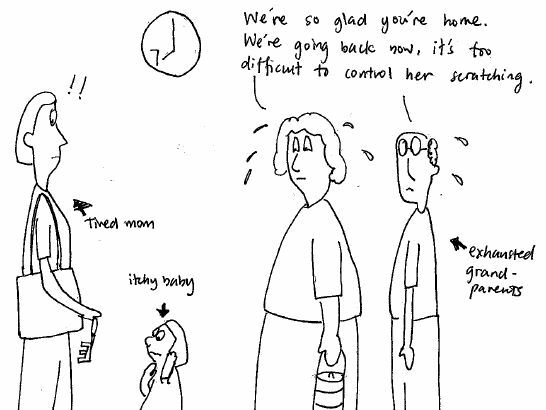 I thought of drawing cartoons for moms and dads to take a break and have a laugh when googling late into the night for eczema information (cartoon on this in link below). That’s my motivation for this blog – concise post for parents who don’t have time and a cartoon for a quick laugh! I love your illustrations! I think they are a very creative way to share your experience about having a child with eczema. Many people don’t realize the daily challenges that come with this condition.